Dr. Kiran Singh's book deals with the history of Indian Textiles from very early times to the Maryan period. Textiles from an integral part of material culture everywhere. It has a wide coverage dealing with subjects such as raw materials of textiles, spinning, weaving, dyeing, embroidery, trade and commerce-internal as well as foreign-trade routes, labour and guilds which regulated economic activity, the book contains many maps, plates and pictures which illustrate several things relating to textiles. Altogether the present book presents a comprehensive, balanced and straightforward account of a highly important aspect of economic life in ancient India. The specialist and the general reader, both will find the book on Indian Textiles extremely useful. Dr. Kiran Singh, a meritorious scholar completed her education from the Banaras Hindu University, Varanasi. She was awarded Indian Council of Historical Research Scholarship to complete her PhD. Her research work earned recognition by getting selected for the financial assistance from the ICHR for publication in the book form. Dr. Singh is married to an army officer and plans to further her academic interest in the field of Ancient History. Dr. Kiran Singh's book deals with the history of Indian textiles from very early times to the Mauryan period. Considering the long period and a wide range of subjects it covers, the author's attempt to encompass such a vast subject in a single volume of modest size is, indeed, commendable. In the preparation of the book she has largely relied on literary, archaeological, numismatic and epigraphic sources. She has made judicious use of Buddhist sources and the Arthasastra which contain a wealth of valuable material on economic life. Besides, she has consulted a number of scholarly works published in recent years, which have greatly contributed to our knowledge of many aspects of economic life in ancient India. In utilizing both primary and secondary sources she has shown considerable discrimination and maturity. The references from literary and other sources give ample evidence of the author's ability to analyse a variety of materials relevant to the study of the subject. Dr. Kiran Singh's book is concerned with textiles which form an integral part of material culture everywhere. It has a wide coverage dealing with subjects, such as raw materials of textiles, spinning, weaving, dyeing, embroidery, trade and commerce-internal as well as foreign-trade routes, labour and guilds which regulated economic activity. The book contains many maps, plates and pictures which illustrate several things relating to textiles. However, for want of reliable data on the volume and value of the textile trade, the book throws little light on this aspect. Altogether the present book presents a comprehensive, balanced and straightforward account of a highly important aspect of economic life in ancient India. I have no doubt that both the specialist and the general reader will find Dr. Kiran Singh's book on Indian textiles extremely useful. The present work on "Textiles in Ancient India, from Indus Valley Civilization to Maurya period", is aimed at tracing the way of manufacturing textiles of ancient India, which controlled and directed the progress of economic life and achievements of the Indian people. In modern perspective, textile industry has its own value and is playing a very remarkable role in overall development. So the modern idea of organization, techniques of manufacturing garments, distinct continuity of Indian commercial relations and its profound influence on the life has something very common and attractive with the textile manufacturing in ancient India. The period mentioned was the time when the proper 'human civilization' had begun and very thoughtfully organized the economic pattern in a very scientific way. In any case, the earliest man has left little evidence to enable us to investigate his activities and achievements. In this the term 'textile' is significant in the sense that a complete study is made in order to show the advancement of material culture through the ages. 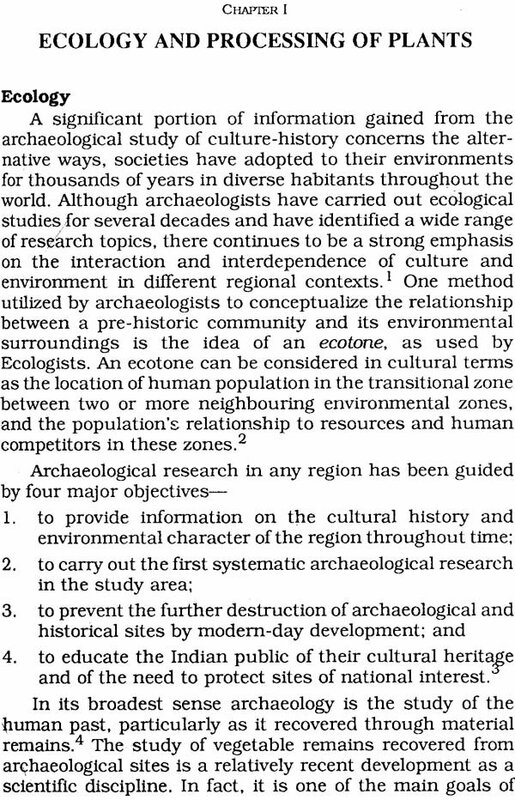 As regards to sources this work is mainly based on literary, numismatic and archaeological evidences. On each form of economic aspects concerning textile and trade, we have very largely utilized the Vedas and the two great Epics-i.e., the Ramayana and Mahabharata. We have also utilized the Dharmasutras of Gautama, Baudhayana, and Apastamba because of their traditional importance. For the study of religious ceremonies in which the strict rules were followed for wearing different kinds of dresses to different castes and people, the Brahmanas helped us a great deal. For this utilized the Aitareya, Taittiriya and Satapatha Brahmanas have been referred greatly. But the most important sources of this study are the Arthasastra of kautilya and the Manusmriti. 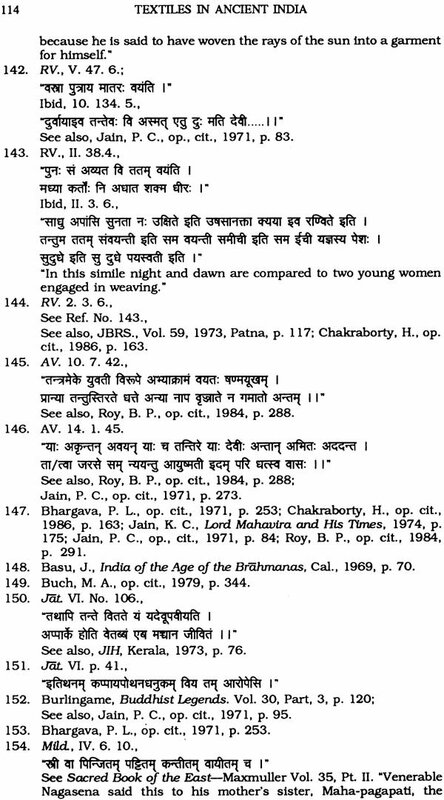 Our literary sources centre round the works of Maha-bhasya of Patanjali and the Astadhyayi of Panini. Among the Buddhist sources, the works like Divyavadana, Mahavagga, Chullavagga, Lalitvistara and many important sections of the Nikayas' have furnished the valuable material for our study. The Jatakas preserve the ancient Buddhist traditions and it is generally accepted that they depict economic and social condition of the 3rd Cen. B.C. As it is noticed, textile had occupied a prominent place in the life of human-being in ancient India. A number of secondary sources are there to deal mainly with the economic aspects of any period, in which, like other arts and crafts textile got little attention, leaving no special effects on mind. So far, none has made a thorough study on this particular topic. So this appears to be an interesting topic to go into the details of and bring out a clear picture through a systematic and analytical study. For this purpose only such aspects of the sources are relevant which examined with the textiles industry. It may be pointed out that several Indian and foreign scholars have given valuable informations pertaining to different stages of economic life. In his book, Early Indus Civilization (1984) John Marshall tries his best to give some idea about Indus valley textile industry. In the Age of Nandas and Mauryas (1952), K.A.N. Sastri has also dealt with the magnificient state's commercial policy, likewise R.K. Mookerjee in his Chandragupta Maurya and His Time, (1966) and Romila Thapar in her Asoka and the Decline of the Maurya Empire (1961), both have examined the guild system, trade and commerce of that period. Regarding guild system, R.C. 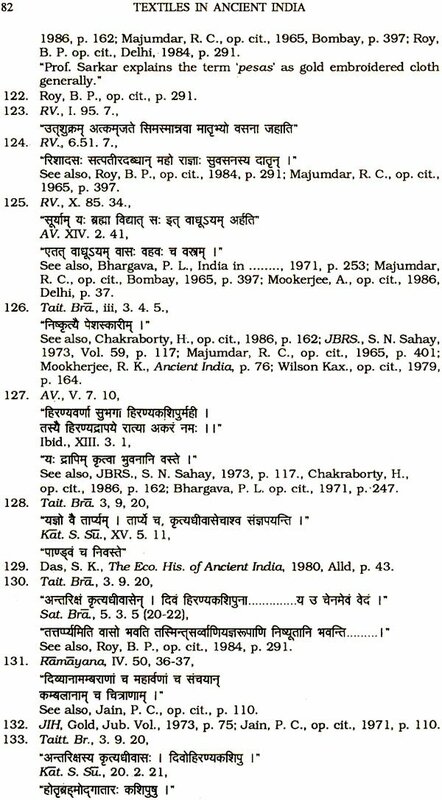 Majumdar's Corporate Life in Ancient India (1969) and P.C. Jain's Labour in Ancient India (1971), both are really praiseworthy. As we go further, John Marshall and Prakash Chandra Prasad gave welcome accounts over trade-routes and means of communications in their books Mohenjo-daro and Indus-Civilization (1973), and Foreign Trade and Commerce in Ancient India (1977), respectively. Sufficient help from M.A. 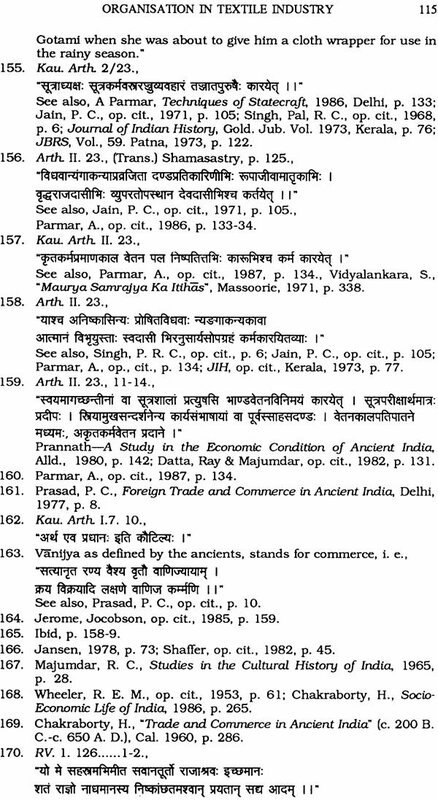 Buch's Economic Life in Ancient India (1979), and S.K. 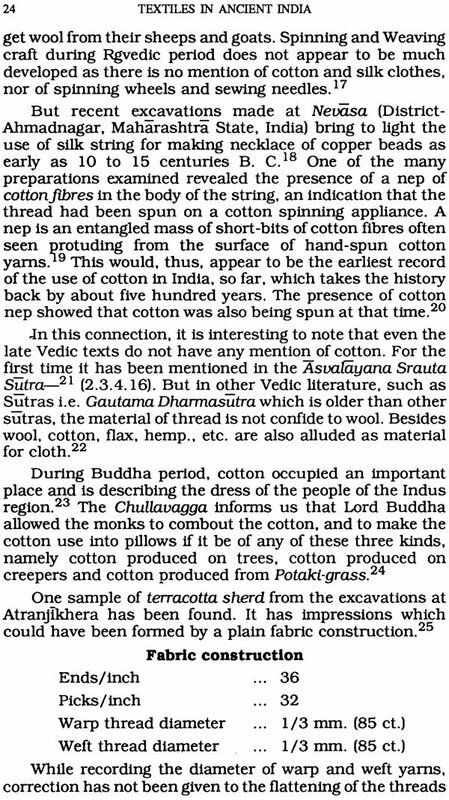 Das's Economic History of Ancient India (1980), as regards to textile technology, cannot be minimized. An attention has been paid by Brijdeo Prasad Roy in his book Later Vedic Economy (1984) over manufacturing technique of Vedic period. 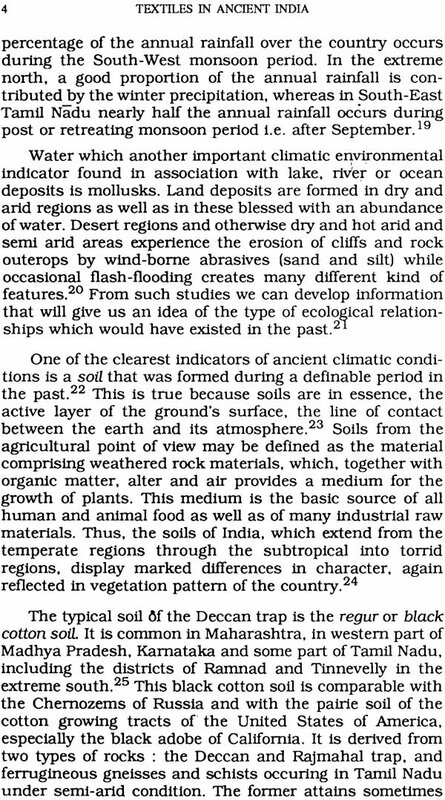 In this field recent publications helped a lot like Science and Civilization in India (From earliest time in C. 1500 B.C.) (1985) by A.K. Bag; Aniruddha Roy and Bagchi's Technology in Ancient and Medieval India (1986); Socio-Economic Life of India in the Vedic Period by H. Chakraborty (1986), etc. etc. 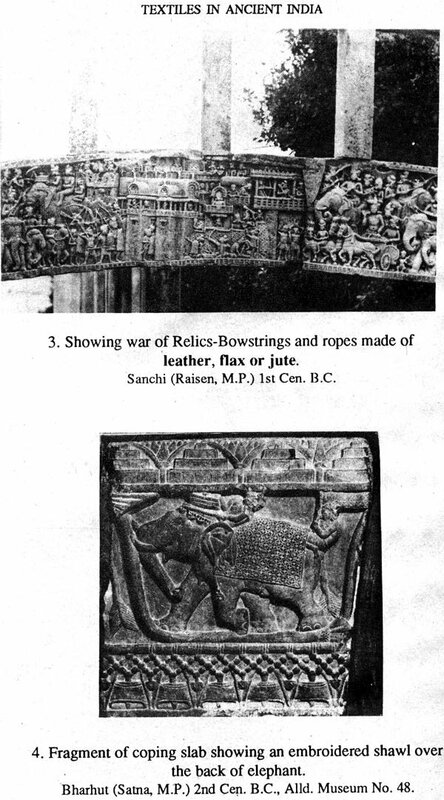 Producing nice existing stock of manufacturing technique and raw materials of textile, Neelima Dahiya, in her book Arts and Crafts of Northern India (from earliest times to C. 200 B.C. 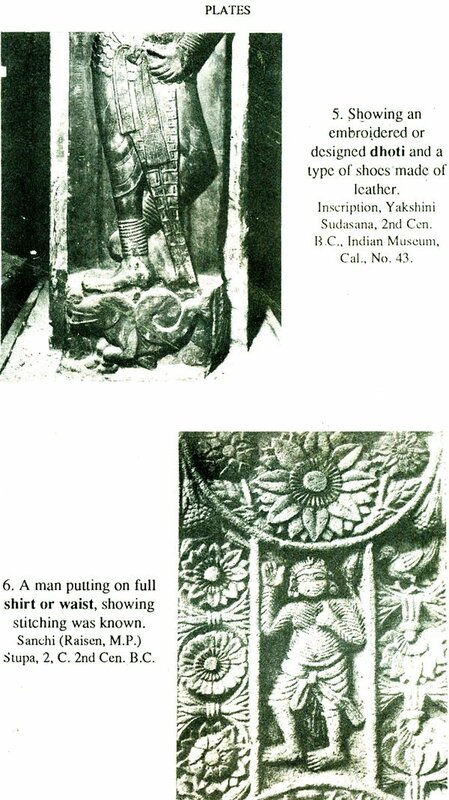 ), 1986 and Malti Mahajan, in Development of Material Culture of India (from 6th cen. B.C. 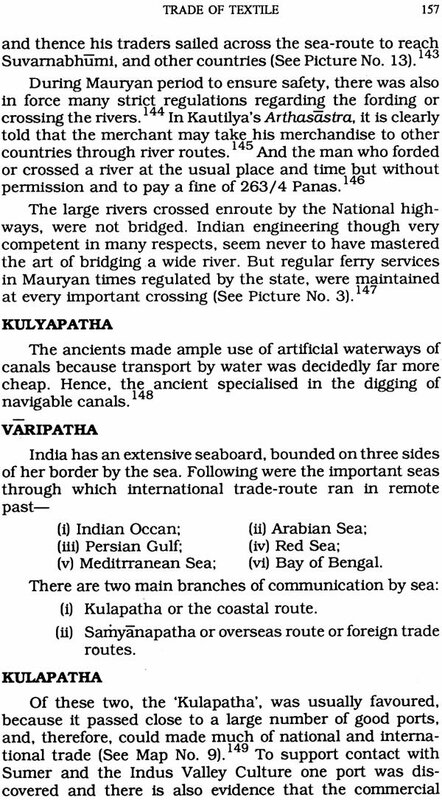 to 300 A.D.), 1986, left no doubt about its validity of oldest industry of India. This book has been divided into six chapters. The first chapter is introductory and traces the ecological background with regard the textile's origin and processing of plants. 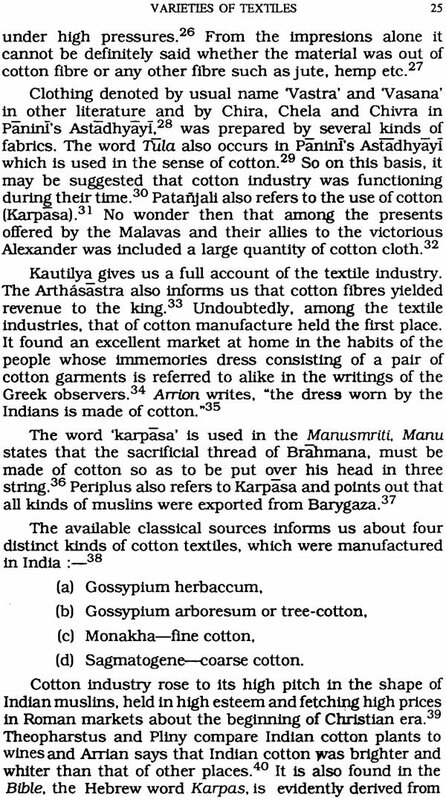 Necessary raw-materials were available in the way of plant fibres-", Seed fibres "Cotton or Karpasa" and wool and hairs, it had not only originated rather it had developed uninterruptedly during subsequent period as evidenced from the account of classical writers. 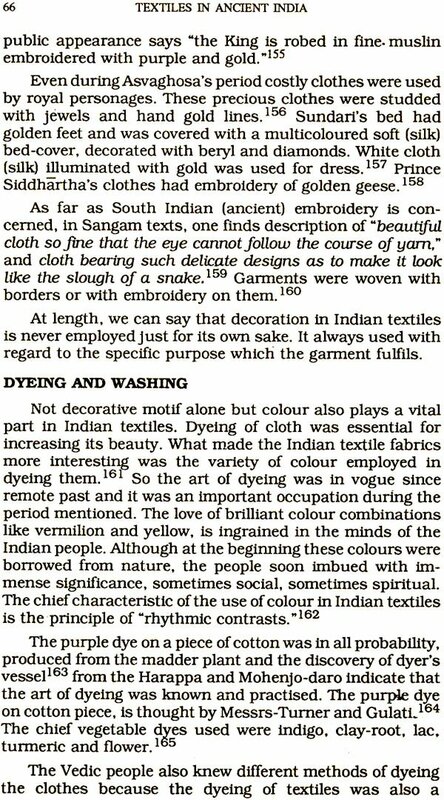 In the second chapter entitled "Varieties of Textiles", a detail study has been done for cotton (Karpasa), Woollen (Urna), Silk (Kauseya), Linen (Ksauma) and leather garment (Ajina-Vasin). The third chapter deals with the "Manufacturing Techniques of Textile", which includes spinning and weaving. Dyeing, washing and sewing. Different archaeological findings as well as technical terms like 'tantu', 'otu' confirmed the practice of spinning and weaving during prehistoric time. Kautilya and Manu frames rules for careful washing. One of the interesting feature of that period was attribution of different colour sheds through the process of dyeing. The word 'Pesas' reveals the practice of embroidery work. The fourth chapter is entitled as Organisation in Textile Industry. The main topics are included i.e.. Guild organization; different individual organizations such as spinner and weaver, dyer, washerman, embroiderer, tailor and leather workers; women's contribution in textile industry and regulation of wages. The guild were multifunctional organization i.e., Trade union, price-controlling authority. Banker and money-Lender-all rolled in one. The heads of guilds were called as "Jettaka" followed by merchant guild known as "Sarthavaha" who had sufficient knowledge of routes. Evidences showed that all individual organizations were bounded by the hereditary of profession and localization of Industry. It was the duty of the state to provide safety to the artisans. A general survey shows that women made unique contribution in this field followed by artistic attainments despite of their all domestic responsibilities. Wages and tax were fixed as regards to quality and quantity of clothes and in course of time this made a serious check on malpractices in the distribution field. In the fifth chapter different "Centres of Textile Industry" has been dealt with where plenty of textile goods of high quality were produced both for domestic as well as foreign markets. 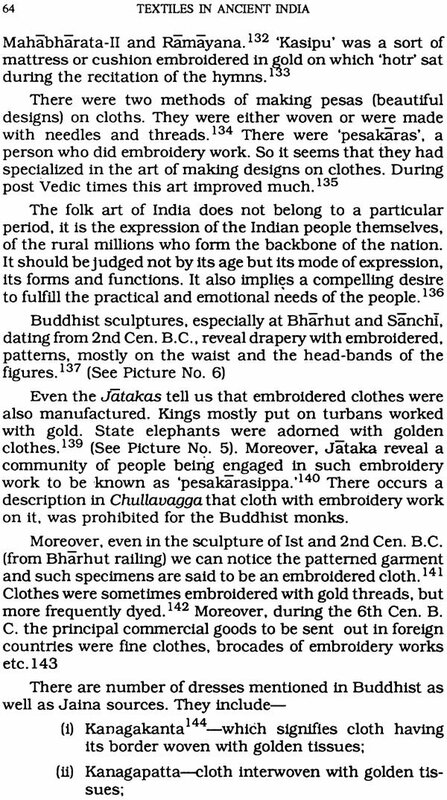 Cotton garments from Madurai, Aparanta, Kalinga, Kasi Vanga, Vatsa; Kauseya (silk) from China bhumi, Dakshinapatha, and Tamralipti; Woolen garments from Nepal, Kasmir and Punjab; Linen fabrics from Kasi, Pundra, Magadha and other places; preparation of skin and fur clothes in the north-west of the Himalayas as well as in the western India found frequent mention in various sources. At last, by giving detail description regarding "Trade of Textile" an extra effort has been made to give a clear picture of internal as well as external trade. This includes-Trade Regulations, Export-Import and trade-routes i.e. Land-routes and Water-routes. India had trade links with the various parts of ancient world atleast since the opening years of Christian era. Just as Chinese were skilled in the field of silk, Indians were expert in the sphere of cotton and fine muslin goods. 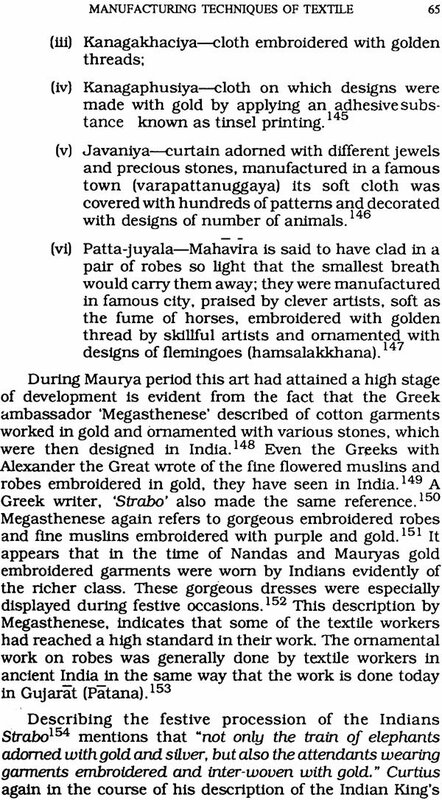 As regards to export and import, the Roman historian Arrian testifies export of dyed cloth and silk from Masulipatnam. Land-routes those going to north-wards, the Himalayas were said to be better going to south. 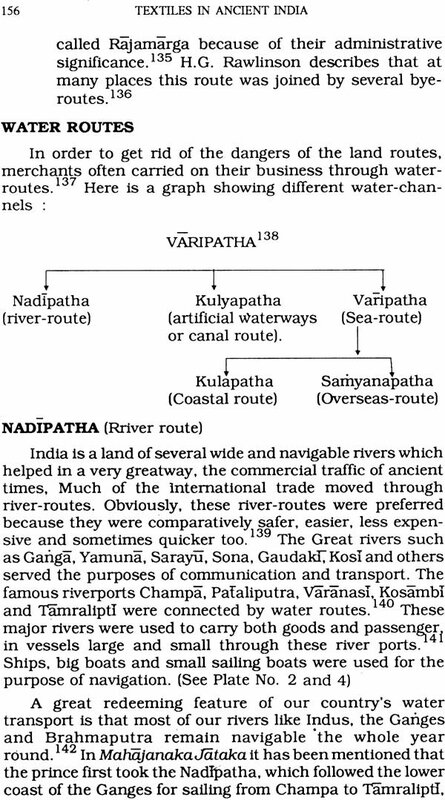 River-routes like Ganga, Krishna, Kaveri and Mahanadi were utilized for trade. By the Maurya period, with the eastward expansion of Aryan culture "Tamralipti" became the main sea-port, and brisk trade was carried on between India and Ceylon as with Persia and Suvarnabhumi. Indian cotton, linen and fine muslin, had been circulating in greater or lesser measure in all these markets. In conclusion it is stated that the nature of trade seems to have changed gradually with the passage of time both in value and volume. The knowledge of different kinds of raw materials, the process of manufacturing textile of its most delicate texture of extreme beauty; knowledge of sewing and organization-all combined together, suggests a highly advance stage of textile manufacturing in Ancient India during the early centuries of Christian era.